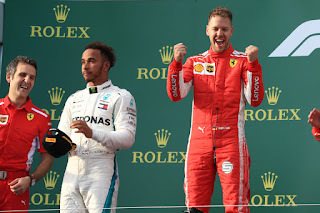 Talking about F1: The F1 blog: Australian GP Report - Who's smiling now? 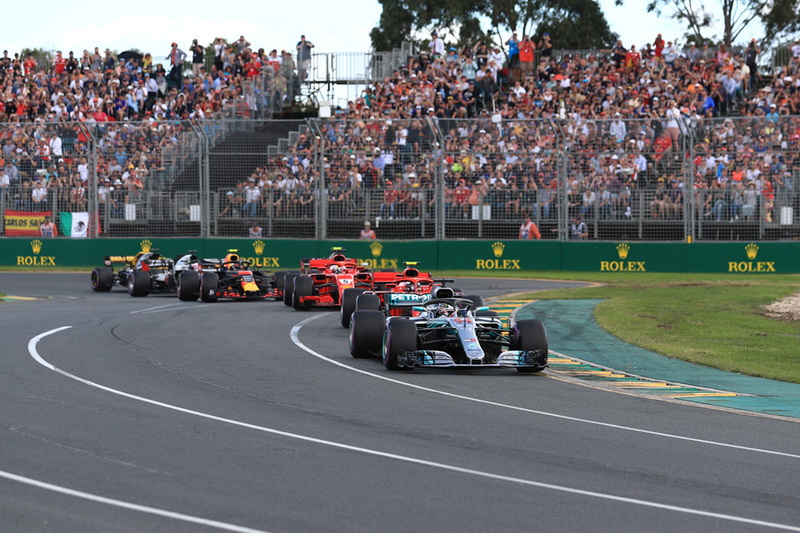 For all that much is new in contemporary F1, the pecking order in the season-opening Australian Grand Prix in Melbourne's Albert Park looked terribly familiar. The grand reveal of the first qualifying session confirmed the efficacy of the pre-season testing grapevine. We had a tight midfield with Haas heading it. Ferrari and Red Bull close to each other. Mercedes well clear. There was a hiccup - Valtteri Bottas binned it in qualifying and started 15th. Yet Lewis Hamilton stunned all with his final effort and was nine tenths clear on pole. There was much talk of a special Mercedes 'party mode' for the last of quali, denied by all in the silver camp. 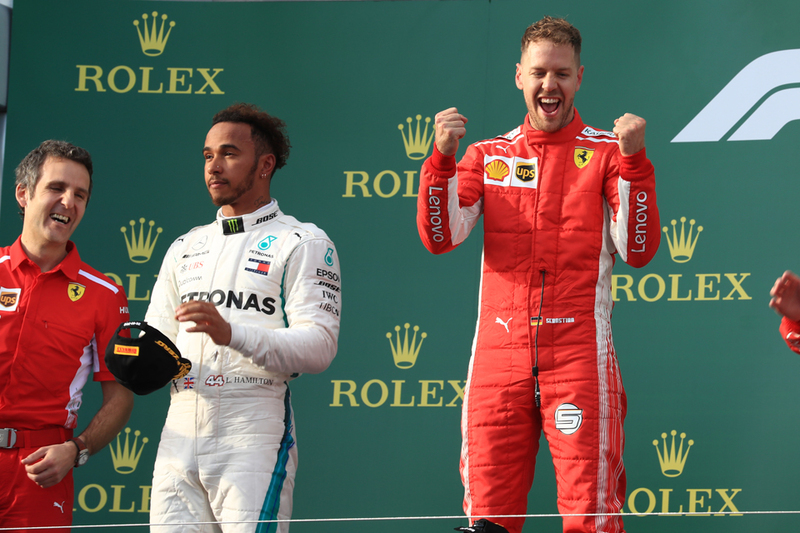 And when jibed by his rival Sebastian Vettel on the subject Lewis retorted that his late boost instead was the desire to "wipe the smile off your face". "I think what goes around comes around," Seb rejoined. "He's free to have a party tonight and then hopefully Kimi [Raikkonen] and myself will have a party tomorrow." It seems he's as good a mystic as racing driver. Come the race things initially were in a similar vein to qualifying however. Lewis didn't run away from the Ferrari pair next up but looked undeniably comfortable. As for Vettel, he wasn't even the fastest Ferrari as Kimi set the Scuderia pace. In that familiar way it was all rather follow my leader too. But it remains the case that anything can and does happen in a Grand Prix race, and it started just before half distance with both of the haughty Haas pair in turn being released from their pitstops without a wheel attached. Romain Grosjean, the second to suffer, parked on the exit of the first complex and this heralded a Virtual Safety Car (which in time became a full Safety Car deployment). Kevin Magnussen not for nothing called the double retirement "heartbreaking". There was a more immediate consideration though. Virtual Safety Cars can really turn races on their head, by allowing cars to pit and save something in the region of 10 seconds to the normal loss, as all others tool around more slowly. Seb hadn't pitted at this point as he was attempting some kind of offset. Lewis and Kimi had, as Lewis had come in to cover an early-ish stop from Kimi. Seb thus made his sole stop smartly and emerged suddenly in the lead and the day was in a beat unrecognisable. Yet the extent of the switch, and that Lewis was in danger, surprised even the Mercedes pitwall. "I thought we were safe but there was obviously something wrong," noted Lewis's engineer Peter Bonnington sheepishly on the radio, after Lewis had insisted on a postmortem. 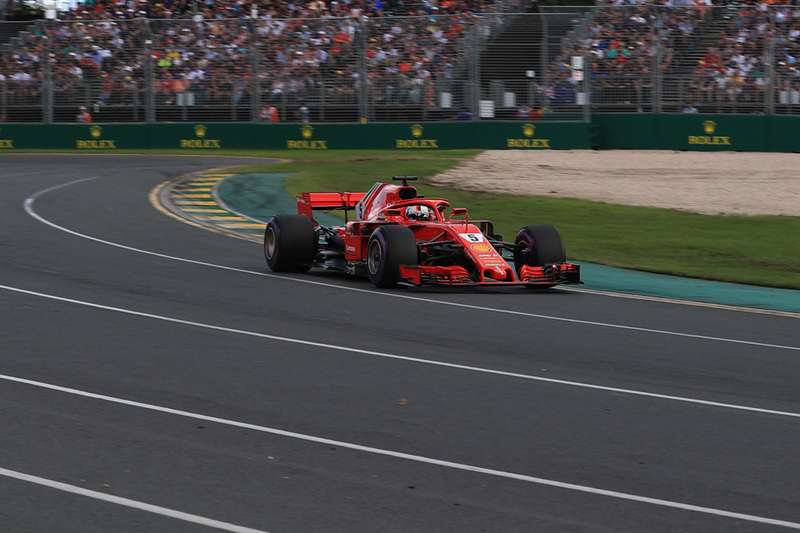 Furthermore Ferrari, and Mercedes, had to some extent made their luck, as it all was an indirect result of Ferrari making a pincer movement on Lewis. Maybe it can be traced back to Bottas's crash in qualifying and that he wasn't around to help. 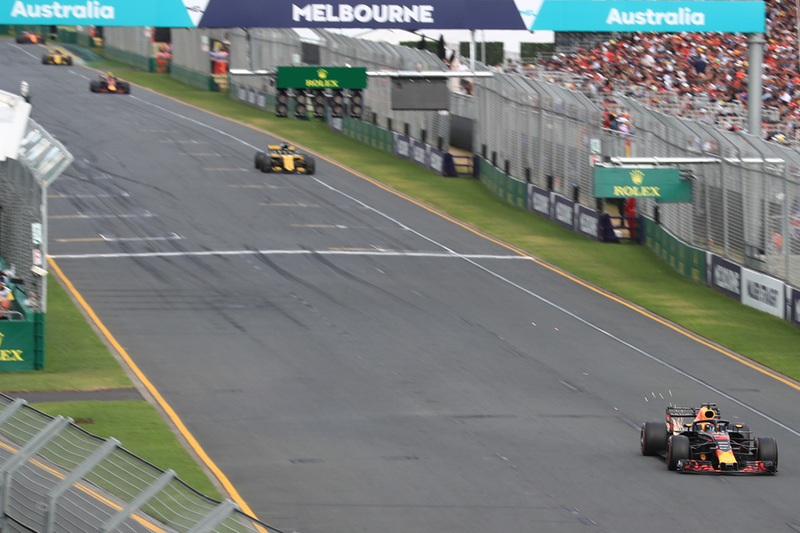 We know too that overtaking in F1 isn't easy; particularly not at this Albert Park track. Particularly not in a Mercedes which it seems is designed primarily to run out front. And, oh yeah, if there's anyone you'd have convert a lead to a win to save your life it's Seb. Just beyond half distance the cars were released to race again and Lewis harried the Ferrari. There was no shortage of effort, but that became part of the problem. At one point Lewis declared he was "going for it" but ran wide and lost two seconds half a lap later. He scampered back to within a second with five laps to go but not long later he fell back again, now in conservation mode and ceding defeat. Seb won and Lewis was an unforeseen runner up. Seb accepted he got lucky, and that the major take for Ferrari from this one is that Mercedes has major ground on it. "We have some more work to do, but we're getting there," Seb said soberly on his slowing down lap. "We got a bit lucky obviously", was about the first thing to pass his lips on the podium. "My start could have been better, it didn't really work so I had to settle for third and then at the end of the first stint I lost a little bit of the connection to Lewis and Kimi ahead. I was struggling a little with the tyre. I was praying for a Safety Car! "But we'll take it. It's a good start, a good win and fresh motivation for the next few weeks." And Lewis's take was similar. "It has been an incredible weekend," he said. "To arrive and have the performance we've had today. Big congratulations to Sebastian and to Ferrari. "Today obviously they did a better job and we've got to go back to the drawing board and work on it but we still have great pace, our qualifying was great. "I think that during the race I was able to apply some pressure at the end but this is one awesome circuit but it's so hard to overtake, even with the extra DRS, obviously with the cars being as close as they were so, at the end I was really trying to live to fight another day, save the engine, and we'll try and regain the points later on. There were similar stories further down. Daniel Ricciardo, recovering from a grid penalty for not slowing sufficiently under a red flag in practice, similarly harried Kimi in third all the way after the safety car period but as with Lewis didn't have many opportunities to pass. They also therefore finished in that order. 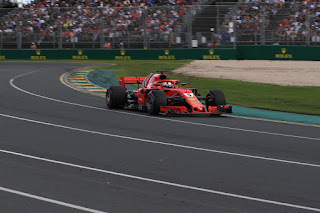 And that wiliest of foxes Fernando Alonso was another to benefit, vaulting to fifth place under the mid-race shuffle which he knew how to keep, even though the effervescent Max Verstappen was darting and dodging in his mirrors. Max indeed had a frustrating day, first being bottled up behind Magnussen early on, then spinning... A reminder that he yet has the odd rough edge. As for McLaren the result wasn't entirely lucky, the car looks now in the vicinity of the likes of Renault and Haas at the front of the midfield (though Nando didn't really max qualifying). At the very least its decision to switch engines from Honda to Renault looks entirely vindicated. Nico Hulkenberg followed Max home in seventh; Bottas salvaged eighth. The other McLaren of Stoffel Vandoorne then the other Renault of Carlos Sainz - the latter suffering from nausea in the race's latter part, after earlier complaining of a lack of power - completed the scorers. Force India and Williams underwhelmed, while Sauber did better than expected. Marcus Ericsson looked racy all weekend though retired early having lost power steering, while his team-mate Charles Leclerc got home ahead of Lance Stroll's Williams and Brendon Hartley's Toro Rosso. Not everything changes as we are often reminded. Today's Australian Grand Prix with its surprise tilt reminded us of a few more familiar aphorisms. That in F1 there is many a slip between cup and lip. And that, no matter what, prizes are not handed out until the end of a Sunday. That's when the smiles matter. The slow cars are still so far behind. If there was not a Safety Car they would all have been lapped.My Team Haas has moved up to best of the rest, but are still far off the leader. In IndyCar all teams are close and Push to Pass. But are all the same. Not F1 history, so no go. Not enough fuel to increase the boost for passing? Botas should have made it to the front of the slow cars by the end. Not enough blue flags maybe. Since the teams can not figure out a way to always get a tight wheel, the FAI shold tell them exactly how to do it. They must not be able to tell until the cars move. Grosjean could have been tied into the pit crew on the radio and they could yell stop. But they would have to push him back. A simple pressure switch pushed by the wheel, tied into the go light should work. Anyway the season for my team Haas looks good. Yes Haas very much confirmed the pre-season testing promise in Melbourne, though equally it's near impossible for the rest to keep up with Merc/Ferrari/Red Bull, those teams simply dwarf the rest in budgets etc. It would be interesting to know if some kind of mechanism for pitstops not letting a car be released without all wheels attached could be brought in. Then again, that Haas lost two big points hauls is a big deterrent! Sadly overtaking in F1 is difficult, and not getting easier despite F1 wrestling with the problem for years. Thta whoel problem of aerodynamics... Plus the Albert Park track isn't great for passing opportunities. Haas says wheel cocked and nut turned anyway and cross thread and wobble. The only long term fix I see is return to re-fueling. IndyCar takes 7 sec. to refuel, giving wheel changer about twice the time as F-1. They never have a loose wheel. I have seen 2 times rear wheels, in F1, come off and fly down through the pits. 1 time hitting someone in the back. At least they have the Halo to keep the driver from being hit. Haas said they told the drivers to stop from the pit. Too long for hand signals to be relayed on the radio. They need a direct radio link from the pit crew to the driver and add a pressure switch to show if the torque is correct ASAP. They just set air pressure and assume the torque is correct. I wonder how much boost is being used? Do the slow cars use less and have there engines last? They have such bad aero that more boost would not help? Re-fueling would let them not worry about fuel as much and just worry about blowing up the engine. Champ Car said using a turbo and 12,000 rpm on the V8 Cosworth rather than running 18,000 rpm made them last a lot longer. F-1 must be really unpopular. How do you keep writing with only 1 commenter? Thanks though. Maybe someone will read my comment. Not much on your other site and on f1tech either. I can't access them. Are they still or am I being blocked? Thanks for anonymous. I don't have any of the other. The robot thing is a little hard. Here are some possible problems and fixes for F-1 wheel changing. The wheel placer has to rotate the tire to make sure the studs go into holes in the wheel. He is the only one that knows, by feel if the wheel is seated. The wrench man does not know if the wheel is seated. He tightens the nut and the studs could be on the flats between the holes. The placer is in an awkward position and can not put much inward pressure on the wheel. They should only use one man to change wheels as IndyCar does. Takes off old wheel, picks up new wheel and installs and at the same time checking to see if it is seated, tightens nut. IndyCar does this in about 5 sec. with one man at each wheel. Since fueling takes 7 sec. the wheel changer has time to check for traffic and signal to driver if it is safe to leave. It takes 25 sec. for a F-1 pitstop. Adding 2 sec. will not hurt much. Save money as not as many crew needed. FIA needs to tell them to do it and everyone would be equal. I wrote an e-mail to FIA. They have not responded like they said they would.FIA should apologize and return all loose wheel fines. It is not the teams fault. It is FIA for allowing more than one man per wheel. For 8 years. A simple low cost solution. I hope they have compensated the man that hit by a tire-wheel. If they change at Bahrain, they will admit they made a mistake and will be sued. I thought FIA had tech people. Where were they? I thought of it because I have had a lot practice analyzing what happened to SpaceX rocket crashes. Some kind of mental block is why I have not thought of it for 8 years. I watch F! from 2010 to 2017 over and over and I never thought of it. I apologize to the man that was hit in the back for not thinking of the solution before. F-1 will be laughing stock. Hi Samuel, thanks for this. Pitstop safety is an interesting debate, one that we've had periodically in F1 e.g. when a wheel came off Webber's car in 2013 and hit a cameraman. I'll admit to prejudice on the subject in that I really like the modern F1 pitstop aesthetically, and think it would be a pity to restrict it (I don't think its a coincidence that so many F1 themed adverts use the pitstop as its basis). But also I'm not sure reducing the number working in the stop would necessarily be safer, as all it takes for a car to be released without a wheel attached is the last person in the chain to go too soon and that can happen no matter the number involved. Plus as I said above teams ultimately have the ultimate incentive not to make pitstop errors as it ruins their race! Any team will tell you they prioritise consistency far above ultimate one-off pitstop time. The driver is the last person and he can not go if the tires are in the air. No amount practice, as Steiner said, will completely stop loose wheels. The timing of when to apply the wrench. The installer could signal the wrench man by hitting him with his knee. Still by being on the side I do not know how much pressure and rotation can be generated. I will try it on my car. That should work, but your right any one of the 3 can cause a loose wheel. The installer could forget to rotate the wheel and go ahead and knee the wrench man. This could have happened with Haas. I do not know their sequence. The wheel nut was cross threaded, it would not have come off. I suppose they did not know this. They could have come back to the pits. The wrench may not have been powerful enough to take off the nut and put on a new one. It would have saved a safety car though. One person per wheel is best. He is directly in front of the axle. The path trough the brain is much faster than moving a knee and is less likely to forget. Repeated many times it goes automatic, like toast. So remembering is not needed. Not forgetting to get up and signaling the driver may be hard. I am 73 the young people may not have a problem. Remembering to not go by the driver when the jacks are lowered may be hard to learn and not forget, but IndyCar does it. Only having one person to make a mistake not 3. I like efficiency not aesthetics. Although a fan for 65 years I have not heard or read the debate on loose wheels. Please excuse me if I have nothing new. If you would tell Haas when they get to Europe I would thank you. I assume you go to F1 races. I was wrong. Not 5 sec. for a wheel change. 3-4 sec. with IndyCar. I checked with a DVR. The timer on the screen and car says so and so does my stop watch. Also at 1/15 I can see the rotation of the wheel to align the studs and holes. So the same speed or faster using 1 man. If it does not affect strength, the studs and holes could be rounded and it would be auto seating. If you think a 3 man per wheel is Poetry in Motion, take a look at American muscle with video of a IndyCar pit stop. Watch the left front. He inserts wrench slightly before the car stops, loosens wheel and lays down wrench, pulls wheel off and with one hand lays down wheel, at the same time picks up the new wheel with his left, installs wheel with 2 hands and picks up wrench and tightens nut. In 3.5 sec. With no help. Can Europeans do that? The other wheel changers are slower with help. The Fans would love it. Why did the rear wheel come off in the pits? The studs where tightened while on the lands. When the car moved the studs moved into holes. The nut was now loose and inertia kept it from turning. The turning of the wheel unscrewed the nut. The wheel came off rotating and flew down the pits. Is this what the FIA said or did they give their cover story that the nut was cross threaded? They need new people at FIA. For safety and competition I would thank you if you sent all I have written on this subject to Haas. I would do it, but you have to be media to contact them. Don't want to mess with Fans. I see that F1.com is finally answering questions.